Today is Queen Elizabeth II's 80th birthday. It is the day on which she was actually born, but for some strange reason the formal celebration of this day is in June. I could never quite figure that one out. 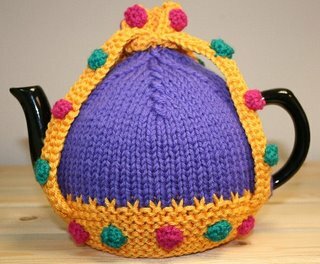 A royal birthday suggests something regal and what better than a "cuppa" high tea brewed under a monarch's tea cozy. I actually knit this years ago from scrap yarns and never bothered to write down the pattern, but I think this is what I did. It is worked back and forth in 2 pieces. Measure with a length of yarn held in a circle the diameter needed to pass over the teapot's spout and handle, maybe with a little stretching and angling. Divide in half and cast on stitches to make one side of cozy. Work 3 to 7 ribs of garter stitch (for a S, M or L pot) in gold. Join contrast yarn(purple) and work in stocking stitch for 1, 2 or 3 ins. Begin decreasing as follows: K2. SSK. Knit to centre 3 sts. Sl 1. K 2tog. PSSO. Knit to last 4 sts. K 2tog. K2. Repeat every other row intil 5 sts on needle. Leave sts on spare needle and repeat for other side. Graph top sts together to join sides and stitch 1" on either side of top join to make join a little longer. For gold brackets make 4 strips of 2 garter stitch ribs each by castin on enough stitches to reach top of cozy plus 1\3 more (this allows for top detail and arching of brackets.) Brackets may be knit into the base of the crown or stitched on after. Join brackets at top by folding over about 8 sts at top end of bracket and tacking fold down. The loose end of the fold will stand up to make 1 of 4 points at the top of the crown. Tack brackets to top of cozy. Make "jewels" in scrap yarn of different colours by casting on 10-12 sts. knitting 1 row and casting of. Join in a circle and tack to base and brackets a t suitable intervals. Join base of cozy and enjoy. The other picture is a crown toilet roll cover. It was part of a show co-ordinated by Lucy Neatby for the Mary E. Black gallery in NS. Lucy asked designers and designer wannabees to design a toilet roll cover in knitting - not crochet. It was a little "tongue in cheek" take off on the crocheted versions. This was my contribution. 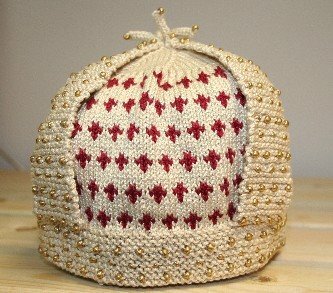 It's similar to the tea cozy ( I can't remember which came first.) but beaded and knit in the round. You can see some of the other entries - this one included at the link below. It was fun and a long time ago. I think we need another one - any takers?